Your pantry is a vital consideration in your kitchen design. It is where you store those everyday grocery items. Careful attention and planning of your pantry design will be the difference between making your kitchen an ergonomic heaven or a daily battlefield. Good visibility and easy access to stored items should be at the forefront of your pantry design goals. You can achieve this by incorporating technology, hardware and attention to detail in the planning phase of your kitchen to bring your new pantry ideas to life. Below are different ways of incorporating a well-designed pantry into your kitchen. Many decisions will be based on the available space on your floor plan, as well as considering your storage vs. bench space needs. From large walk-in pantries to tiny pull-out pantries, there is a solution to fit every individual’s needs. This is the grandest of all pantry designs. 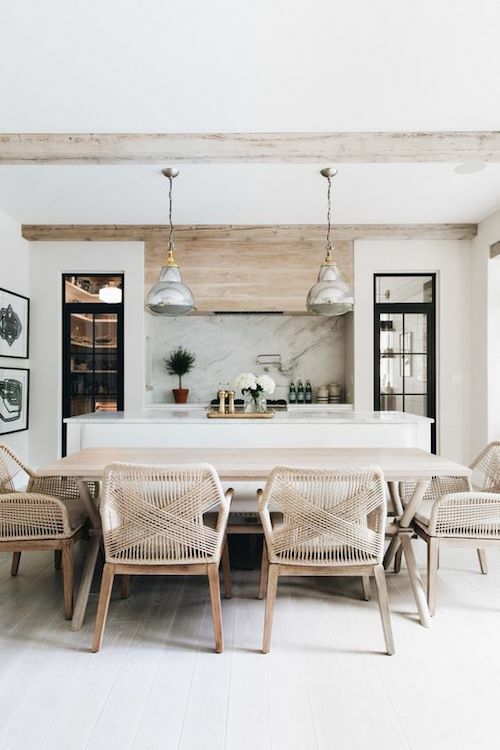 In many cases, it is like having a secondary kitchen that is out of sight and purely functional: storage of goods, a place to prepare food, and above all, a place to hide any mess or chaos. The terminology of a ‘butler’s pantry’ originates in the early 1800s and refers to the space as being, “a serve room between a kitchen and dining room, equipped with counters, a sink and space for china and silver” (dictionary.com). As such, the butler would often sleep in the pantry to protect the valuable silver goods. Today, a butler’s pantry is often used when the kitchen is part of an open plan living/ dining room. The kitchen in the living space is showcased and sparkling clean, whilst the butler’s pantry is the engine of the kitchen, hidden out of sight. You will usually need a generous floor plan to be able to incorporate a butler’s pantry into your design. The advantages of a butler’s pantry is that your kitchen can mostly be kept looking clean and minimal. 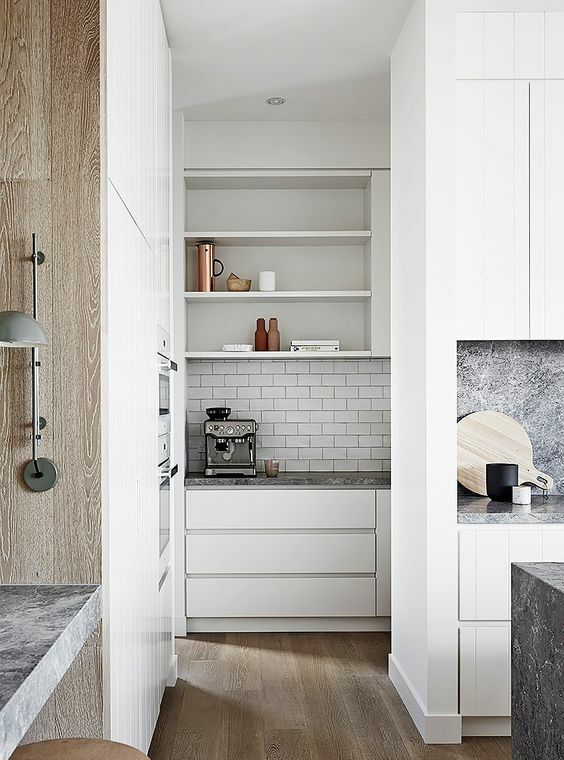 Bulky benchtop items such as mixers and microwaves can be stored in the butler’s pantry with its ample storage and benchtop space. That said, there are a couple of disadvantages, not least that you have a segregated work environment. You may have to spend time hidden away in the pantry, preparing or cleaning items. It is also often quite a distance from the cooktop/oven work zone. Keeping your dry items in the pantry means that these items aren’t easily to hand when you are cooking. Below are some examples of walk-in butler’s pantry designs. Above is the entrance to a butlers pantry hidden behind the kitchen. There is extra benchtop and storage space, which keeps the kitchen in the living space looking glamorous and clean. The above luxurious pantry design is by Toronto designer Rachel Deeks. 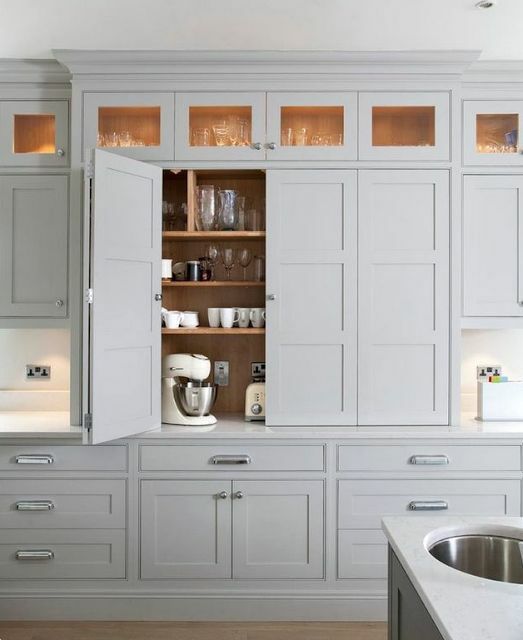 The butler’s pantry, instead of being hidden has become a showpiece extension of the kitchen. Black framed glass doors open onto crafted timber drawers and a stunning marble splash back. A beautifully detailed kitchen, designed by architects Hans Verstuyft. There is a very strong vertical element in this kitchen with its high ceilings. The walk-in pantry conceals the oven and extra storage. The kitchen on display is left with a minimal presence that is both striking and calming. 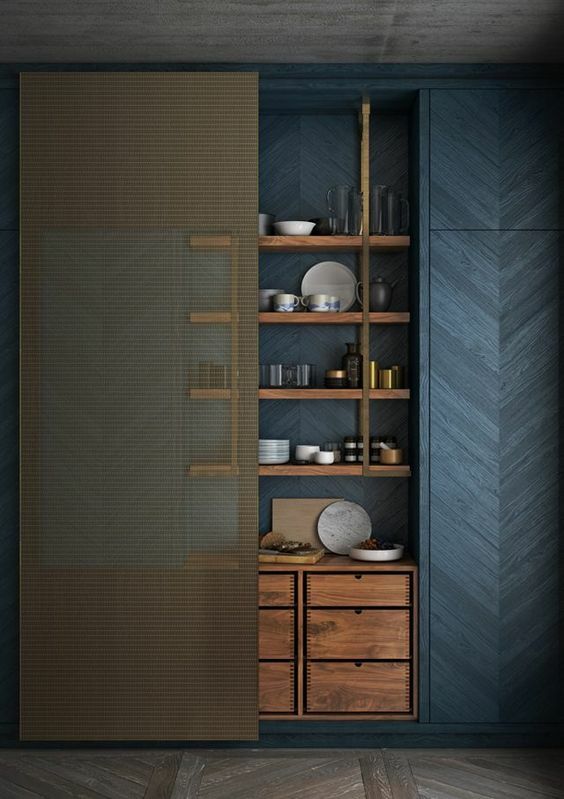 A style of pantry design that is often dismissed is the sliding door pantry. As the kitchen can get fairly tight, it is not always practical to have doors opening into the workflow and traffic areas of your kitchen. A sliding door neatly solves this problem with the door to the pantry simply sliding out of harm’s way. Whilst this is a practical idea, you can ensure it’s stylish too by making the door a feature of the kitchen space. Below are some kitchens that demonstrate this combination of beauty and practicality. Above is a small pantry that has been incorporated into the kitchen layout. 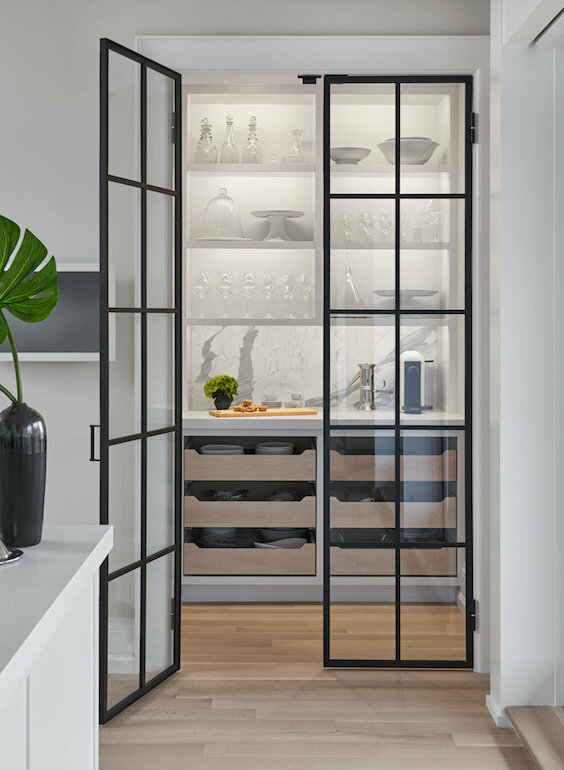 The pantry has been made a feature by the use of a powder-coated, steel mesh sliding door, revealing the beautiful and precise detailing of the timber cabinetry. The mesh sliding door adds a subtle contrast to some of the heavier detailing. This kitchen has a larger storage area accessed by ribbed glass, sliding door panels. The design is elegant and the doors can be closed to block out the clutter of the pantry. The textured glass keeps the space light and bright. It also provides a visual barrier from the storage area behind. 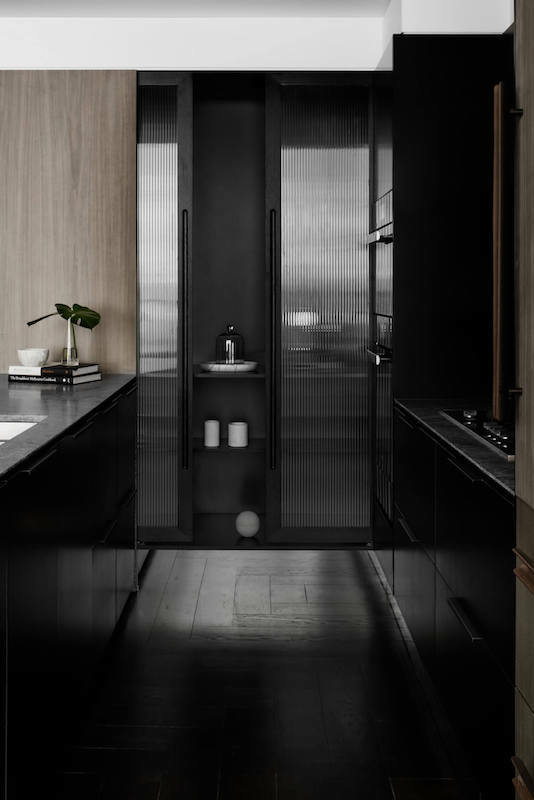 Designed by Melbourne architect Elenberg Fraser, this kitchen is bold and moody. The pantry doors become both a practical and beautiful feature of this kitchen. Ribbed glass doors open easily to an extra storage area behind the benchtops. Having a walk-in pantry is considered a luxury but there are other ways to incorporate smart storage solutions in your kitchen design. Having a concealed pantry in your kitchen near your work and cooking areas keeps the kitchen clutter-free and is a highly practical choice. 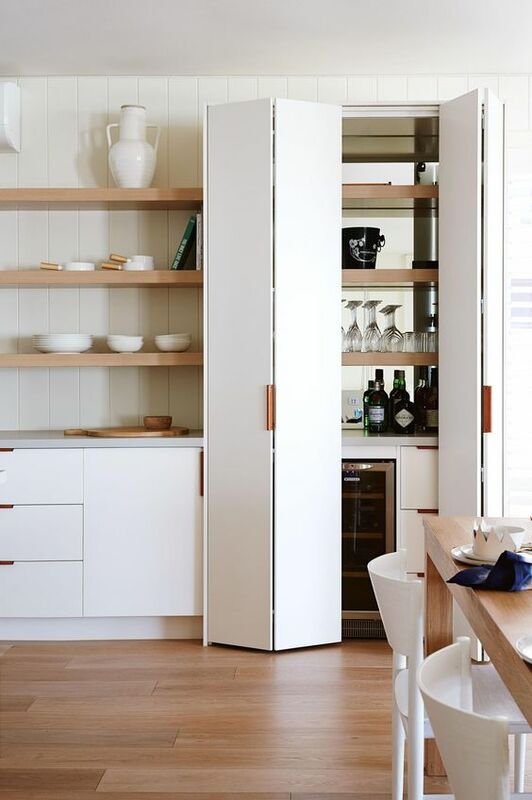 A concealed pantry can consist of full-length doors, opening to reveal extra benchtop and storage areas. The doors can be bi-fold doors, or pocket doors so that the doors recess into a cavity. This is a neat way to keep your kitchen benchtops clutter-free as bulkier benchtop items, such as coffee makers, kettles, toasters and mixers, can be stored behind closed doors. Below are some concepts that demonstrate this approach. Above is a pantry designed using pocket doors. Once opened, the doors reveal an extra work station. It is a place to store bulky benchtop items out of sight. Drawers and open shelves provide storage space for everyday items. Full-length bi-fold doors are used to create a concealed storage/ pantry area in this kitchen. A wine bar is hidden behind closed doors so as not to clutter the living space. Designed by Juma architects, the above photo shows the detailing of the pocket doors in this kitchen design. The pantry area can be used as a breakfast station too. 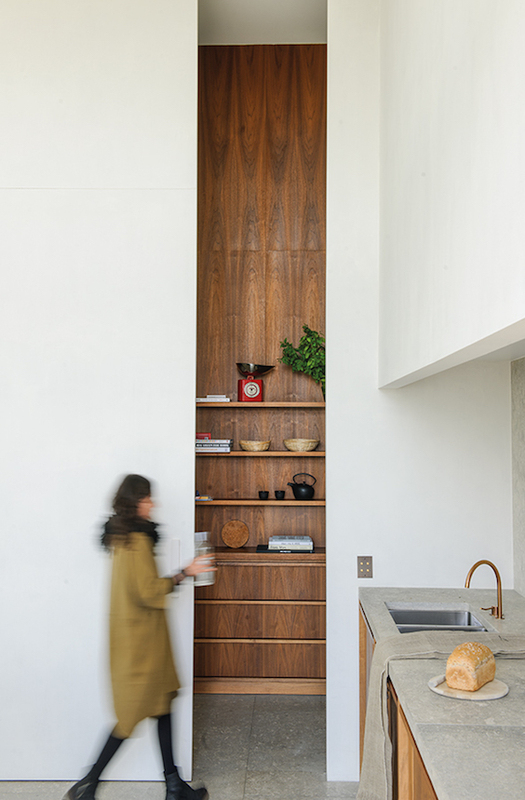 This concealed pantry begins at the benchtop level. 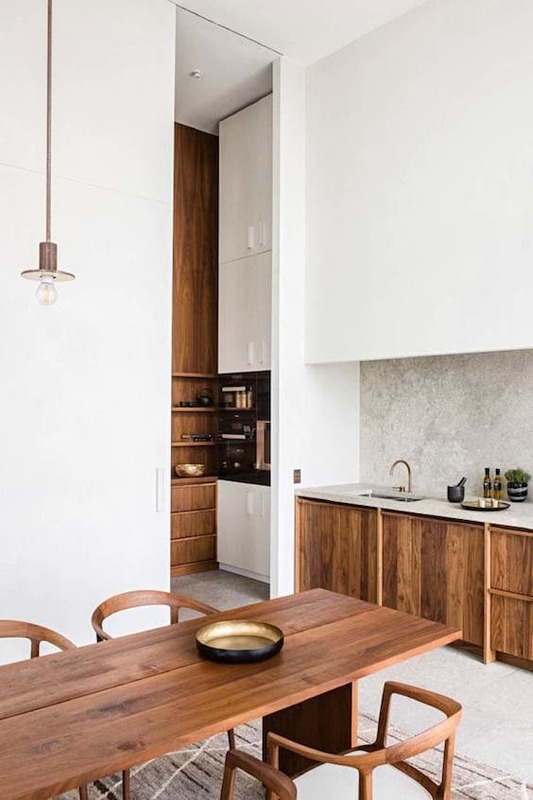 Once opened, the space reveals a coffee and tea station, as well as a storage area for heavier benchtop items that are difficult to move such as mixers etc. Not every kitchen has a floor plan that allows for a generous pantry design. In smaller kitchens, there is often a question to be answered: how willing are you to compromise on bench space for storage/pantry space? It’s a hard question and can only be answered by your particular needs for the space. 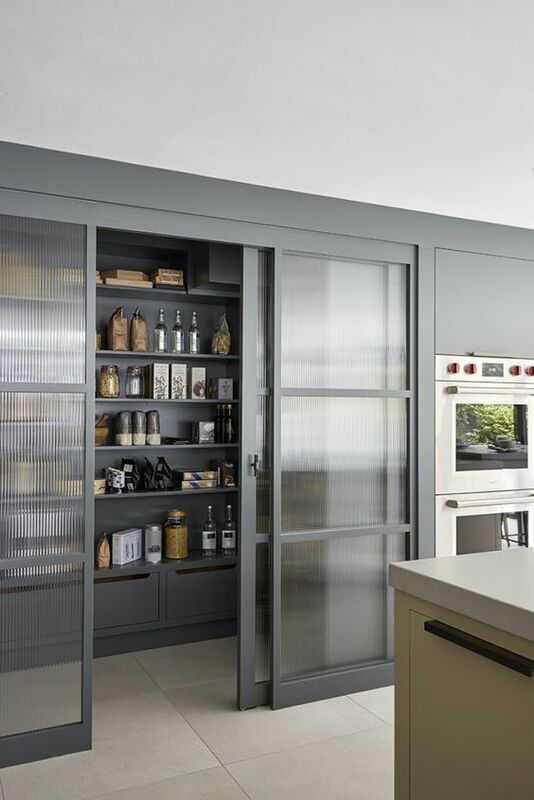 In kitchens where space is at a premium, there are solutions that can maximise storage space for your pantry design. Narrow pull-out pantries are small and provide easy to see and reach access to food goods. Alternatively, individual drawers are a great way to access food items and save space. Below are some examples of different solutions for a smaller pantry. 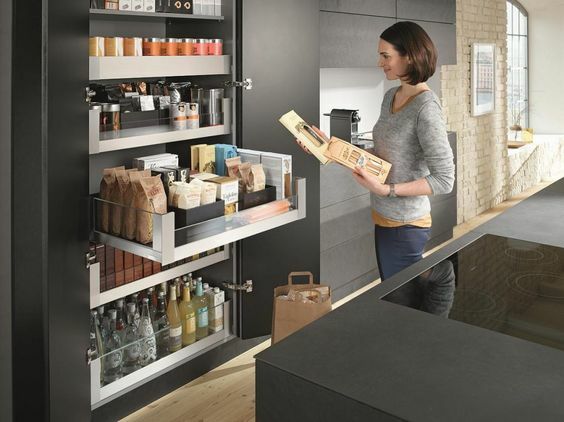 Above, German hardware company Blum have developed their space tower pantry to tackle storage needs. Each drawer is soft-closing and provides a clear view of the stored items via the clear sides. Being able to pull items outwards yourself, you don’t have to dig into the deep, dark recesses of a traditional shelved pantry. 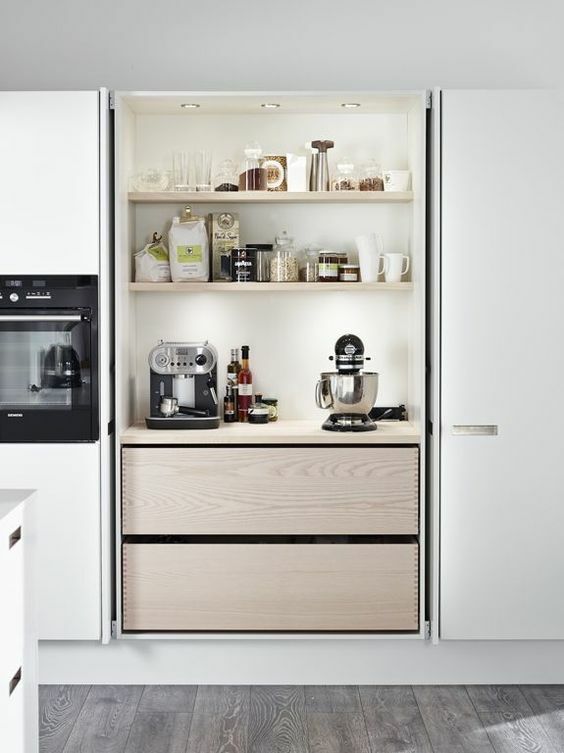 The sizes are also customisable, meaning you can just go for a narrow pantry (as above) or opt for wider drawers instead. Another storage solution in a smaller kitchen is a pull-out pantry. 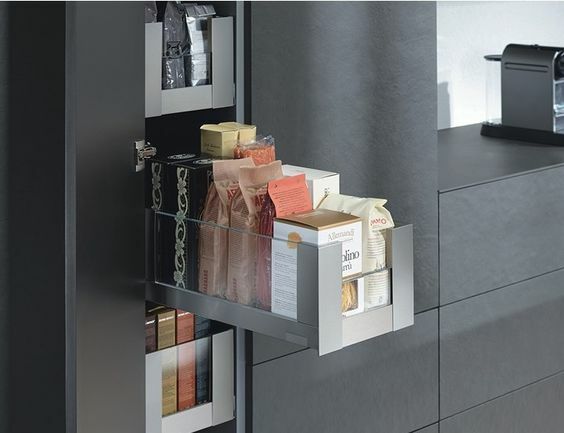 Featured above, this pantry hardware is designed by Hafele. Items are easily visible and easy to reach. A pull-out pantry works best for narrow pantries as it can otherwise be laborious having to pull out a huge pantry just to get to one item. When considering the pantry design of your new kitchen, there are a few questions that need to be tackled: is the pantry in a practical location, can all items be reached easily, will your pantry suit your lifestyle needs, will your pantry fit in with the configuration of your kitchen space? 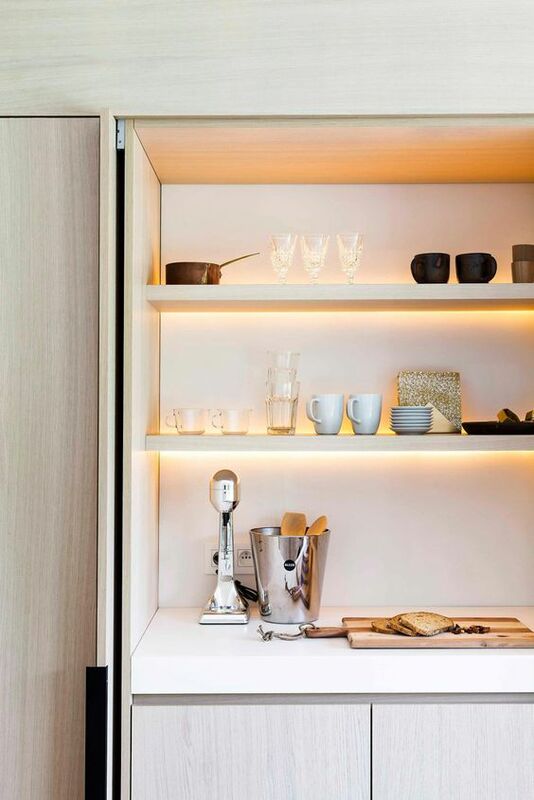 Your designer should work with you to find the perfect balance incorporating hardware, technology and perfect layout planning for your pantry ideas and solutions.